One reader on Amazon criticized this book as being too short, saying that it would have been OK as an article but not a book. It is true that the author has written this book in more of a blog format, but it is still a fun read. Susan decided to take her vacation in England by hiring a motorhome from Motorhome Freedom, a website about motorhomes with an emphasis on motorhome hire. 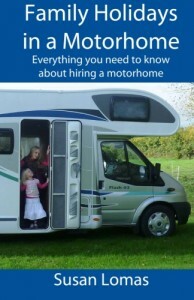 For anybody who is considering a motorhome vacation, this is a good read and can alert you to some of the pitfalls you might come across. Susan Lomas (née Clements) was born in Watford, England in 1964. Rather an energetic child, she studied ballet for a while, quickly moving on to ballroom and Latin American dancing. She was educated in north London and gained a BA Honours degree in Fine Art Painting at Norwich School of Art in 1986. Susan taught Art and Design in a number of schools in Hertfordshire and Buckinghamshire during the 1980s and 1990s.